Meetings can be great, but most aren't. Let's change that. Host, Sharon Tewksbury-Bloom, tells her story about being a bone marrow donor and shares an update about the next season of this show. 00:00 Sharon Tewksbury-Bloom: But if you do get contacted, you have the potential to save someone’s life who really, really needs it. 00:12 Speaker 2: This is Do Good, Be Good, the show about helpful people and the challenges they face in trying to do good. Your host is Sharon Tewksbury-Bloom, a career do-gooder who also loves craft beer and a good hard tackle in rugby. Sharon speaks to everyday people about why they do good and what it means to be good. 00:31 ST: Why hello there, I’m your host, Sharon Tewksbury-Bloom. And I hope you’re enjoying season three, Meaningful Work. I have definitely been enjoying making this for you. It is a labor of love, as me and my editor, Bob, are working really hard to get an episode out each week for you. As we prepare the final few episodes of this season, I wanted to jump on the mic myself and share a little story and a little bit about what might be coming in the future for the show. First, a quick announcement. I am headed to New York City in a few weeks to go to the Werk It podcasting festival, hosted by WNYC. This is a women’s podcasting festival. I went to it last year in Los Angeles and had a really good time. If you or someone you know is going to be at Werk It, I would love to hear from you, I’d love to meet you in person. I’m hoping to connect with a lot of other women podcasters, and learn a lot more about how to make this show great and get it out there to a wider audience. I promise to give you an update once I’m back from New York. 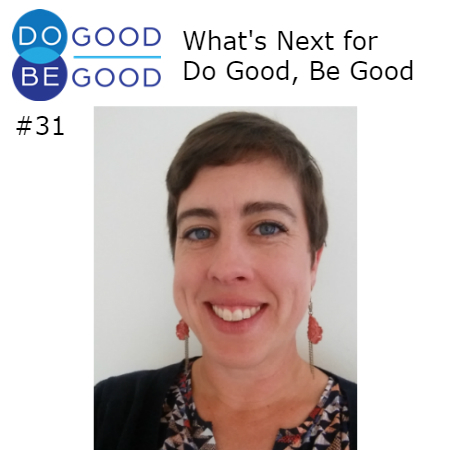 01:37 ST: I’ve been thinking a lot about what I wanna do for future episodes of Do Good, Be Good, especially as we get into 2019. And a big idea that I have is that, for the next season or for a couple of seasons in 2019, I want to actually follow a few people’s stories throughout the year. I really love shows in which you find out some challenge or problem that the person is addressing in their life, and then you get to actually find out what happened. So, that is one of my ideas for 2019. And I’m gonna be looking for a few people who are trying to start something, who have an idea of how to start a non-profit or a personal project, if something, maybe even a business that they’re starting, where your intent is to do good. Of course, as you’ve seen from the show, doing good can take many different forms, it’s a pretty broad topic, but if you have a mission to help other people to try to do good in this world and you’d be willing to have me follow your progress throughout the year, then reach out to me. My email address is connect@sharonspeaks.com. 02:51 ST: So, I’m looking for ideas. This guest could be from anywhere in the country. I’m getting better at figuring out how to interview people who don’t live here in Flagstaff, Arizona, where I’m based, but I want someone who is really willing to be open and let me know what’s going on throughout their journey. My plan is to interview my guests several times over the course of 2019 and then bring those stories together maybe in the summer or in the fall so that we can pick up and see what has happened with their project or their business or their non-profit as they’ve worked on it throughout the year. So, if you or someone you know is trying to start something good early in 2019, and would be willing to have me follow your progress, please reach out, connect@sharonspeaks.com. 03:44 ST: As a little preview of one of the possible storylines for 2019, I may also be following my own story. Recently, I found out that I have been contacted as a potential match for a young man who has leukemia, and I may be his bone marrow donor. I have been on the registry for a long time. If you’re not familiar with it, there is a registry called Be The Match. You can find it at bethematch.org, and it’s a chance for you to put your name and your DNA on file so that if someone has leukemia or another cancer or disease in which they might need a bone marrow donation, they can search this database and find someone who might be a really good match for them and maybe save their life. 04:39 ST: One reason why I joined the bone marrow registry is because I have personal experience with it. When my older sister was only 6 months old, at her six-month checkup, she was diagnosed with acute lymphocytic leukemia, the very aggressive form of the disease, and she was immediately put on a very intense regimen. She had chemotherapy and radiation. She went in and out of remission for the first few years of her life. In fact, she was going through all of that when I was born. I was born when my sister was 2-1/2 years old, and by that time, she had already been struggling with cancer for two years. And her prognosis was not very good. She was put on the Make-A-Wish list, and she went on a trip to Disney World. She also was part of some clinical trials of new treatment options. 05:41 ST: We were lucky to live in the Washington, DC area, and she had access to really great treatment. And by the time she was 4 years old, they had decided that a bone marrow transplant was going to be her best and perhaps only remaining option. Everyone in our family was getting tested. I don’t remember it, but at 2 years old, I was one of those people who was tested to see if I could be a fit for my sister. Luckily, it turned out that I was, and my parents had to make that decision for me. Apparently, I was actually speaking words at the age of 2, and so my mom says that she did ask me for my permission and asked if I wanted to donate my bone marrow. And apparently I said yes. Good thing I wasn’t yet in the terrible twos of saying no to everything yet, but I, at 2 years old, became a bone marrow donor for my sister. 06:48 ST: And it’s hard for me to imagine now, with my parents going in and having both of their children in the hospital at the same time, one undergoing a procedure to have bone marrow extracted and have that bone marrow given to the other sister. It’s a really unique way in which my sister and I are tied to one another. Well, amazingly, this was completely successful. My sister underwent her bone marrow transplant at Johns Hopkins University Hospital, and she went into remission for good. Now, it’s been over 30 years since that happened, and she has grown up to live a healthy life and she has even been able to have a child herself. Now, she has an almost 2-year-old darling little girl, Penelope. 07:45 ST: So, it’s with great excitement and deep personal connection and understanding that I await the news about whether or not I’m going to be a bone marrow donor again. This week, I took the first step, which was to confirm my commitment to going through with this, should I be match, and I went to a laboratory and had my blood drawn. That blood has now been sent to the patient’s doctor, and they’re evaluating it to see if I might be the best match for this patient. I don’t get to know very much about the patient that I might help, but I do know that he’s a 22-year-old male who’s suffering from leukemia. And I hope that I can help him. That’s one story that I plan to keep you updated on, and hopefully we get to see the resolution of it, and I get to actually help this man, and can share my journey with you along the way. 08:46 ST: In the meantime, I encourage you to find out more about becoming a bone marrow donor yourself. You can sign up for free on the website, bethematch.org. If you fill out your information, they will send you a testing kit in the mail. And all it takes is for you to do a little cheek swab. You don’t even have to deal with blood or anything at the stage, you just do a simple cheek swab and you send it back to them, and that puts you on the registry. Once you’re on the registry, you might be on the registry for years before you ever find out. You could go your whole life being on the registry and never be a match. But if you do get contacted, you have the potential to save someone’s life who really, really needs it. That’s all for now, but I will have updates coming for that. And that may be one of the storylines we follow in 2019, as we get into the next season of Do Good, Be Good. 09:44 ST: For now, that’s all. Next week, I will be interviewing my business coach and friend, Diana White, of the Small Business Development Center here in Coconino County. I really look forward to bringing you her story. To subscribe to this podcast, so that you get each episode as soon as it is released, search for Do Good, Be Good in Apple Podcasts, Stitcher, Google Music, or wherever you get your podcasts. Thanks, as always, to our hosts, Sun Sounds of Arizona, and thank you to you, the listeners. I couldn’t do this without you. I wouldn’t do this without you. We really could just be talking to ourselves here. Music in this episode is Bathed in Fine Dust by Andy G. Cohen, released under Creative Commons Attribution International License, and discovered in the Free Music Archive. Until next week, this is your host, Sharon Tewksbury-Bloom, signing off. Previous Post: « #30 What If We Start With Good Enough Now?